This brightly colored cornucopia project is an example of a bountiful harvest. I’ve included a sheet of fruit shapes in this project, but another choice would be for the kids to draw their own fruits. The fruits could also be cut from colored magazine pages. The strips around the cornucopia could be all the same color or any variety of combinations. I can see lots of possibilities for making the project unique——some glitter?? 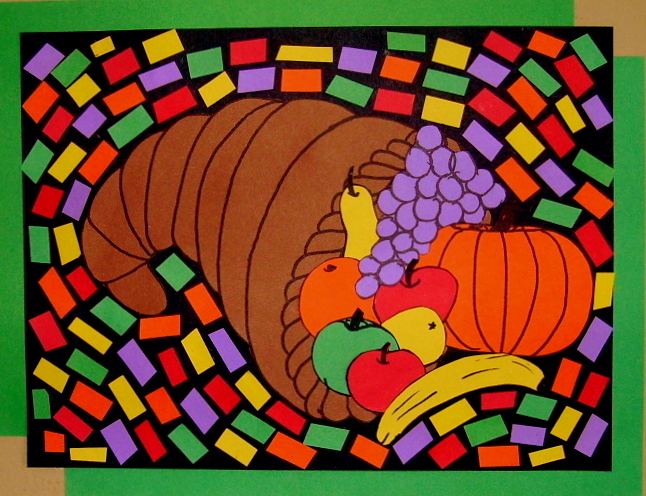 Any class could do this so I’m putting this, “Cornucopia,” in the Thanksgiving Projects Gallery in the sidebar. This entry was posted in Thanksgiving and tagged arts and crafts for kids, cornucopia, cornucopia fruits, fruit shapes, harvest, harvest craft for kids, magazine pages, thanksgiving art for kids, thanksgiving cornucopia art for kids, thanksgiving fruits art, vegetables. Bookmark the permalink.